What were the previous positions you held that led you to being the CEO now? How did these experiences help you be the leader that you are? Prior to joining the banking industry, I worked with Benguet Management Corporation as an executive assistant to the president and head of corporate planning. In 2006, I joined GBP as Chief Finance Officer. In 2013, I was appointed Deputy Officer-In-Charge to the President, before being appointed President in 2017. 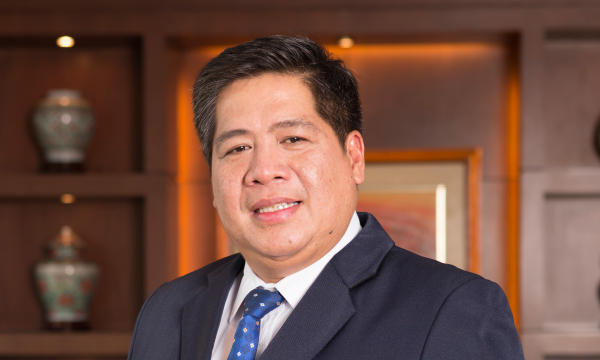 My expertise as an investment banker proved to be instrumental in securing multi-billion peso loan facilities to finance the company’s expansions throughout the years. The US$583m (Php30b) loan we secured for the construction of the 3x82 MW coal-fired power plant of Cebu Energy Development Corporation (CEDC) and the 2x82 MW coal-fired power plant of Panay Energy Development Corporation (PEDC) was then the country’s first and largest peso-denominated long term fixed rate loan facility for an infrastructure project and was entirely funded by local institutions. Until then, the biggest syndicated peso loan only amounted to US$97m (Php5b), and most of the country’s biggest infrastructure projects were funded by dollar-denominated loans. As head of business development and commercial operations, I have also helped expand the company’s operations. From 185.5 MW in 2003, we have now grown our capacity to 854 MW—a four-fold increase in just a span of 15 years. I have also helped our commercial team secure long-term power supply agreements to contract our capacity. What are the biggest industry challenges GBP is currently facing in generation and how do you plan to overcome these? One of the biggest challenges confronting not just GBP, but also the entire industry is the evolving government and regulatory landscape. Government regulations influence energy market dynamics as well as the development of new projects, so changes in policy have far-reaching implications. This is best illustrated by the temporary restraining order issued by the Supreme Court on the implementation of the Retail Competition and Open Access (RCOA). The TRO has halted the mandatory migration of large consumers to RCOA. Another is the implementation of the Renewable Portfolio Standards (RPS) and the Green Energy Option as mandated by the Renewable Energy Act of 2008. Under RPS, distribution utilities must source a portion of their power supply from eligible RE producers, while under the Green Energy Option, end-users must have the option to choose RE as their energy source. All these are happening even as the FiT allocation for various renewable energy sources have begun to expire—for solar and wind projects, FiT ended in March 2016 while for biomass and run-of-river projects, FiT expired on December 31, 2017. We now see a potential gap in policy—on the one hand, we might see a rise in demand for RE due to the RPS that requires end-users to source energy from RE, but the expiration of FiT might hinder development of future RE projects that may help meet the potential increase in demand. What is GBP’s biggest plan to date on the generation side? What should the industry be excited about? Now that we have established base load power plants in high-growth areas in the Visayas such as Cebu and Iloilo, we have always been keen on expanding our footprint outside of the region. A key development in 2017 was setting up our presence in Mindanao by acquiring a 50% stake in Alsons Thermal Energy Corporation (ATEC). ATEC is the holding company for all base load coal-fired power plant assets of Alsons Consolidated Resources, Inc. (ACR) located in Mindanao. Our entry into Mindanao has given us a platform for growth in the island, which will enable us explore its largely untapped energy market. Our business development team, meanwhile, has also begun exploring various opportunities—we are in the pre-development phase in Luzon (through Global Luzon Energy Development Corporation) in line with our goal to establish presence in all three island groups, and we are actively studying various opportunities into the renewable energy sector. What are the newest generation projects that you have? Our newest generation project was the completion of the 1x150 MW coal-fired power plant expansion of Panay Energy Development Corporation (PEDC) in Iloilo. We built PEDC’s third unit in response to Iloilo and the region’s growing demand for energy. The expansion plant commenced commercial operations on January 26, 2017. Our partnership with Alson’s Group has enabled us to establish footing in Mindanao through Saranggani Energy Corporation (SEC) and San Ramon Power Inc. (SRPI). SEC began operating its first unit with 105 MW capacity in April 2016 while the second unit is being constructed. SRPI, on the other hand, is in the pre-development phase of a 105 MW base load coal-fired power plant in Zamboanga City. Mindanao is a particularly exciting frontier because its electricity market is still in the infancy stage and its interconnection with the Visayas grid is in the works. What do you think is the Philippine’s biggest energy problem at the moment and how should this be addressed? Government regulation and policy still remains the most crucial aspect in the success of the energy sector. For one, the suspension of the commissioners of the Energy Regulatory Commission (ERC) has created uncertainty among industry players, and many stakeholders have been awaiting resolution to this matter. The continued operations of the ERC, as a regulatory body, is important to the smooth functioning of the entire sector. Power supply contracts must be approved by the ERC, and without approval, developers might not be able to secure financing to fund their operations and/or expansion. Banks usually require ERC approval to show the developers have secured contracts for the projects. There is, of course, the suspension of the implementation of RCOA, which has stalled the mandatory migration of contestable customers to RCOA. Without this, the full intent of EPIRA cannot be realised and a truly competitive energy market cannot emerge with so many regulatory barriers hampering the implementation of the law. On the one hand, we have a rapidly expanding economy that posted 6.7% growth in 2017, which is one of the highest growth rates in Asia. On the other, we have an energy sector on a wait-and-see situation due to regulatory gridlock, which might hamper prompt response to the country’s energy demands.